(Nanowerk News) Automotive, aerospace and machinery industries, among others, are resorting more and more to the use of 3D printing methods to produce manufacturing components. There is a strong demand that the technologies involved in this process produce parts with stronger functional properties. This requires the development of new adaptable materials. Researchers at the University of Lorraine in France say that quasicrystals, a type of complex metal alloy with crystal-like properties, can be useful in the design of new composite materials for this purpose. In a review published by Science and Technology of Advanced Materials ("Complex metallic alloys as new materials for additive manufacturing"), Samuel Kenzari and co-authors summarized recent developments related to the use of complex metal alloys in additive manufacturing. Additive manufacturing, commonly thought of as 3D printing, is a process that involves the manufacture of components from a digital model. Traditional manufacturing methods often start with an object and remove material from it in order to obtain the final component. In additive manufacturing, lasers are employed to build layers based on a digital model, ultimately resulting in the final component. 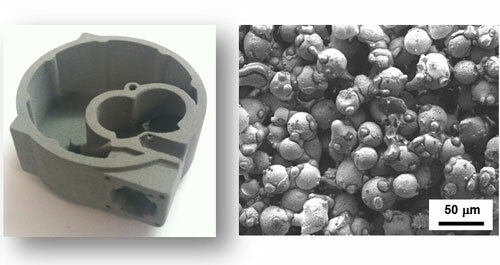 Additive manufacturing methods are becoming widespread and affect many industries. In 2012, they generated global revenues of US$ 2.2 billion. But the range of materials used is still restricted despite a real demand for manufacturing lighter parts with better functional properties. Incorporating complex metal alloys (CMAs), such as quasicrystals, in the design of new composite materials can help meet this demand. Complex metal alloys are promising because of their potentially useful properties such as low friction, relatively good corrosion resistance, and good resistance to wear. They are also, however, intrinsically brittle, preventing their use as bulk materials. Scientists, reports the University of Lorraine team of researchers, have found alternatives to circumvent this problem. One is to use CMAs as reinforcement particles. The other is to use them as a coating material. CMAs have been used together with metals to develop lightweight composites that can be used in building 3D parts. These parts have mechanical properties similar to those of steel-brass composites currently used in the industry but with the advantage of having a lower density. “Automotive and aeronautics industries are happy to have functional parts with a lower density,” explains one of co-authors, Prof. Fournee Vincent. “Reducing the weight of vehicles reduces fuel consumption.” A practical example is shown in figure. Quasicrystals have also been used to reinforce polymer matrix composites used in 3D printing technologies. These new composites present several advantages compared to other materials with regards to friction, wear, and sealing. Functional parts using both kinds of alloys are already being commercialized. Pipes and intake manifolds used in fluidic applications surrounding car engines are a good example. The researchers are currently working on the development of functional parts made using CMAs that have health applications.